In-sung Lee is a Project Partner in Samsung’s Center for Creativity Development who’s tasked with selecting and managing C-Lab projects. Created in December of 2012, C-Lab (Creative Lab) is an in-house idea incubation program that was started to help Samsung employees turn their innovative ideas into reality. Lee strongly believes that good ideas come in all shapes and forms. To help ensure that the best of the best projects get made, Lee has developed his own unique criteria for evaluating C-Lab submissions. For some, good ideas are hard to come by. That, however, is not the case for In-sung Lee. As a Project Planner in Samsung’s Center for Creativity Development, Lee comes across great ideas every day. It’s his job to select the best of the best out of Samsung employees’ C-Lab submissions. The innovative ideas that receive his seal of approval take one big step closer to becoming reality. But what exactly is Samsung’s C-Lab program, and how does Lee select which projects will be developed? Read on to find out. C-Lab is Samsung Electronics’ in-house startup incubation program that was created to bring its employees’ most innovative ideas to life. Lee is not only in charge of selecting C-Lab submissions, he’s also in charge of incubation, as well as analyzing selected ideas’ marketability, making sure that the development process remains on track, and identifying the most desirable path for each project. Creativity is key when it comes to C-Lab submissions. 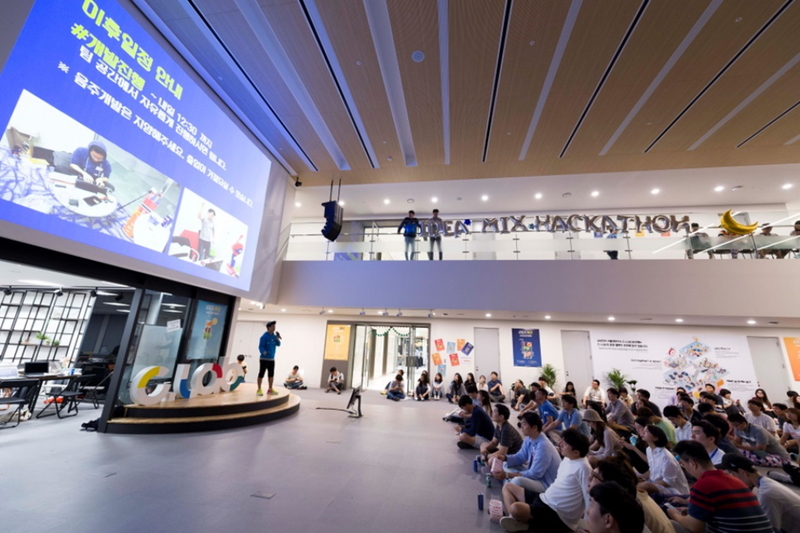 To help get their creative juices flowing, Samsung regularly hosts interactive employee events like the recent Idea Mix Hackathon, pictured above. Part of the process of assessing C-Lab projects’ commercial potential involves presenting the innovations at relevant exhibitions. Here we see a showcase for IGNIS, a thermal imaging camera that helps firefighters locate people who need to be rescued. Lee regularly organizes interactive exhibitions and hackathons that nurture employees’ creativity and encourage them to come up with the sort of dynamic ideas that would be perfect for C-Lab. As he notes, Samsung employees represent a wide range of backgrounds and expertise, and the ideas that they dream up are just as interesting and diverse. Lee studied mechanical engineering at university, and began his career at Samsung Electronics as a developer. Since joining the Center for Creativity Development, he’s continuously wrestled with the question of how to define an unequivocally good idea. The answer, he’s found, is not so cut and dry. Since he became in charge of selecting ideas for C-Lab projects, Lee has created his own criteria for picking the best of the best. Lee takes great joy in his work, and is always looking forward to hearing Samsung employees’ next innovative C-Lab proposal.